But as the laborer at the cottage, I’ve been trying some new things, with a modicum of success. My confidence was up (inflated, even) until this past weekend. I’ve been sanding the old windows that will go above the kitchen sink. 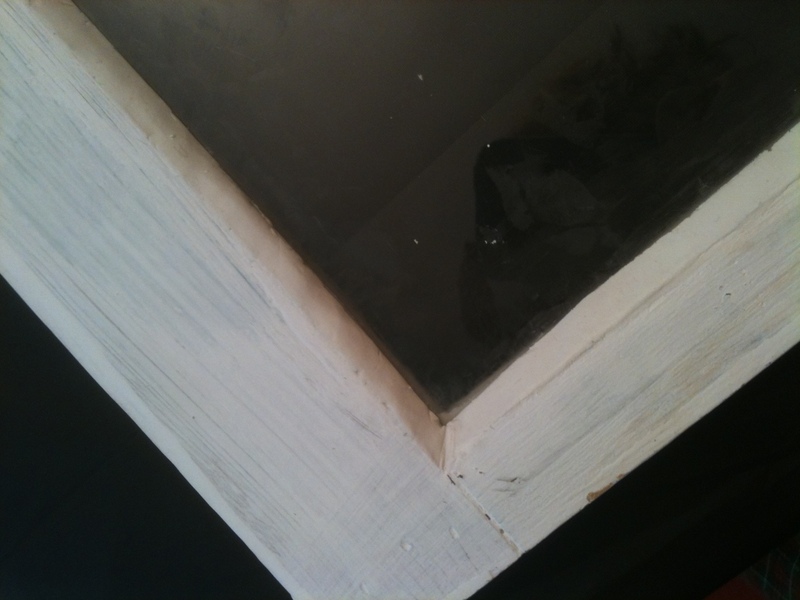 I took out the glass — pane by pain (no blood though) — scraped, sanded, and primed. Eventually it was time to replace the glass; the correct term is reglazing and there used to be people who did this as a profession. They were called glaziers. They have my utmost respect. 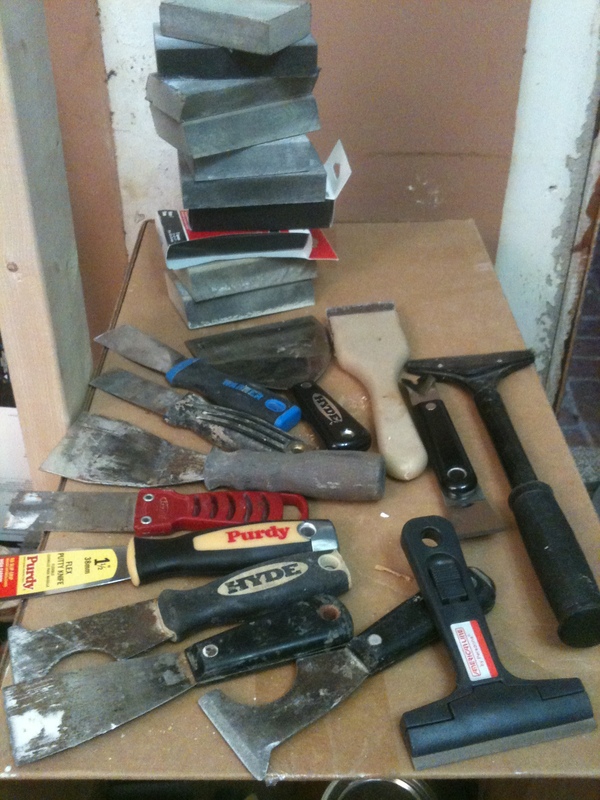 I was about to do a real DIY blog post entitled, “How to Reglaze your Old Wood Double Hung Windows.” Notice that is not the title of this post. I took lots of photos and even cleaned my fingernails. I had visions of About.com contacting me and asking me to do regular DIY posts. I am fairly good at artistic endeavors: I can sew, knit, and scrapbook. I have made a couple of quilts. I can do passable graphics, and I’m really good at using scissors and coloring. I am very good at reading directions. I nailed the first part of the glazing process. I have about twelve good photos from that first part, which is called the back bead. In effect, it sets the glass in place and seals the inside. It is easy. You just make snakes of the glazing putty, push the glass in, put in the points to hold the glass, and scrape off the excess putty. Would you like to see my pictures??? When the going gets tough, the tough go take a nap. Two hours of napping and the longest, hottest shower I could take, and Voila! Michael has the entire window finished. Technically, I am delighted that he could do it, and it looks great. I am glad to have a talented husband. The thing is, I’m supposed to do the unskilled labor and leave the jobs that only he can do (and there are a lot of those!) for him. I was supposed to be able to do this… This is a lesson in humility. Oh, I know that Dr. Seuss sent his first book in and it was rejected multiple times. Madeline L’Engle‘s book A Wrinkle in Time (which later won the Newbery Award) was rejected 29 times. It took Thomas Edison 10,000 times to get the filament right on his first light bulb…I KNOW ALL THAT! And these failure quotes that you are about to read — I’ve read them all a dozen times. They are platitudes: boring, insipid, and … true. Yes, that’s what happened; I certainly lost my enthusiasm and never regained it. The ironic thing is that we had just had a discussion about fear of failure in church the day before! God asked Moses to lead his people out of slavery, and Moses politely declined at first. “Send someone else, God. I’m not really good at what you want me to do…” We all fear failure, but as those quotes above point out, failure is always a lesson. It could be a lesson in hard work, or lack of preparation; it could be an opportunity for a second chance, or to encourage creativity and enthusiasm; it could be a lesson in losing gracefully or developing patience; or it simply could be to learn humility. Moses went to Pharaoh to ask for the people’s freedom. Seven times (at least) he went. Can you imagine what he was feeling that last time? “Oh no, Lord! Do I have to go again?? ?” God chose Moses, so His strength would shine through Moses’ weaknesses and failures. Failure is not only all those lessons above; it is a God-given gift! So we won’t live proud. So we can be thankful for those failures. I’ve got three more windows to work on. I will certainly do the inside seal, but I’m not sure if I’ll try the outside bead of putty again. Perhaps I just need to practice…or perhaps it is a skill I won’t ever master. I need to know for sure, though, don’t I? 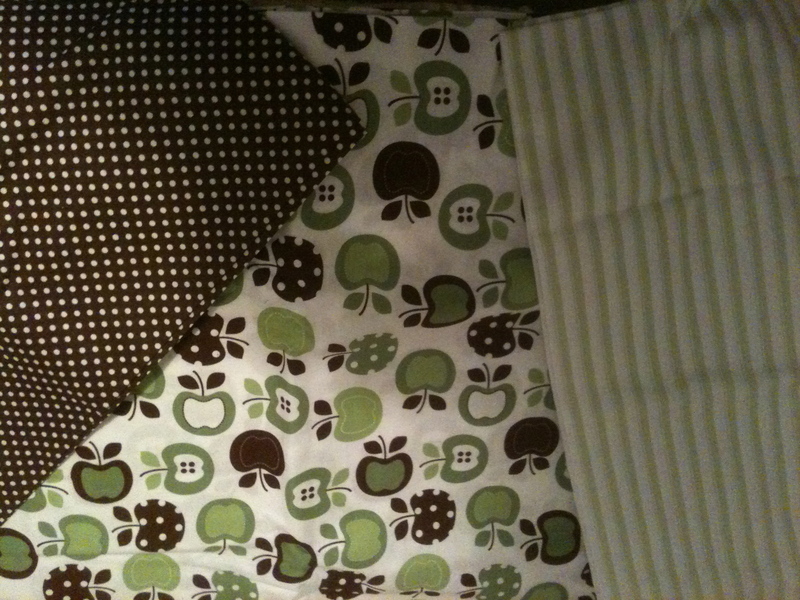 In the meantime, I’m sewing some shelf liners from this great apple fabric I ordered. No fear of failure with this project! But we can feel bad about it! Yes! And then we can laugh at ourselves for feeling bad about it! I love the story, the quotes and Moses! Having a depressing morning, I read the failure quotes and am ready to start this day over again. Thank you Carol! I am so glad that the window glazing experience did not staunch your irrepressible spirit. You are so talented in so many things. I love the shelf covers. Well…I say, a nap and a hot shower do wonders for depressing mornings!